Sonoma County’s newest cannabis dispensary, Solful in Sebastopol, is getting to know the community the best way they know how: they’re throwing a party—a Swim Suit Cosmic Dance Party, to be exact. 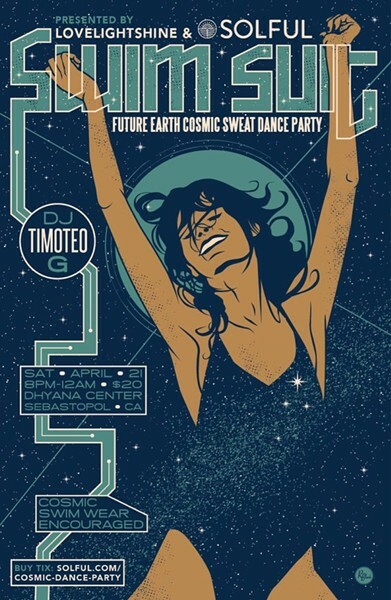 The shindig encourages partygoers to dress in aquatic or sweat gear, and features modern dance music from across the globe presented by DJ Timoteo Gigante, whose west Sonoma County production company, Love Light Shine, co-hosts the event. Get to know Solful and dance the night away on Saturday, April 21, at the dhyana Center, 186 N. Main St., Sebastopol. 8pm. $20. solful.com.